The Spinsterhood Diaries: Spinster Shopping: Watermelons! Well, Spinsters, in my time of making Spinster Shopping collages, I have discovered that one often begets another. I'll be searching around the internet and realize I'm seeing a lot of one thing or another, so I'll get the idea to make a collage of that. As you could have guessed from the image above, one of the things I've been seeing is Watermelon. Watermelon as a fruit can run the gamut between tasteless and delicious, depending on how adept one is at choosing fruit. When chosen correctly, though, it is so refreshing. A few years ago at the Rose Bowl Flea Market, I had what I guess I could describe as watermelon juice. It wasn't just watermelon-flavored. It was actually the juice of a watermelon, and it was one of the tastiest beverages I think I've ever had. The items in today's list may be a little on the kitschy side for most people, but on the right person, they could be really cool. Thankfully for the more conservative dressers, though, not all of these are wearables. So ch-check out the links! I can just see these looking so cute at a summer party all sticking out of an ice bucket. This is probably one of the most secretive ways you can show your watermelon love. How many people have even seen your hair brush? If you want to spend the big bucks on a summer handbag, then this might be for you. I know, I know. No one needs a watch anymore because we all use our phones. However, I think that's why people are getting more into fashion or novelty watches right now. Care for a slice of watermelon for your wrist? I'm a sucker for socks. I just can't get enough of them. For those spinsters who are trying to ease their way into a Katy Perry styles. It's themed, but it's a bit more subtle than a dancing shark. I love a good pool float. The older (and chunkier) I get, the less interest I have in just sitting out in the sun. I'd rather be in the pool where I can't actually tell whether or not I'm sweating. This pool float is a bit pricey, but it's really cute. Urban Outfitters also has one shaped like a pretzel, a pizza one, and a giant pink flamingo. I feel like this is something I would have had in childhood. In fact, I may have had one...or maybe I'm just imagining that. Just imagine this as a summer update to your bathroom, though. If you wore this to Disney World, no one would bat an eye. Everywhere else, you'd be a standout in the rain. Everyone has a favorite flavor of Jolly Rancher. Mine happens to be cherry, but I'm glad that my research for this post has brought to my attention that I can, in fact, purchase an entire roll of just cherry jolly ranchers. This is excellent news. Pictured here, though, are the watermelon flavor because...well, that's what this post is about. If you're still able to wear a string bikini without wanting to hide, then good on you. Maybe your'e on a watermelon diet....which actually doesn't sound too bad. I'd much prefer that to grapefruit. 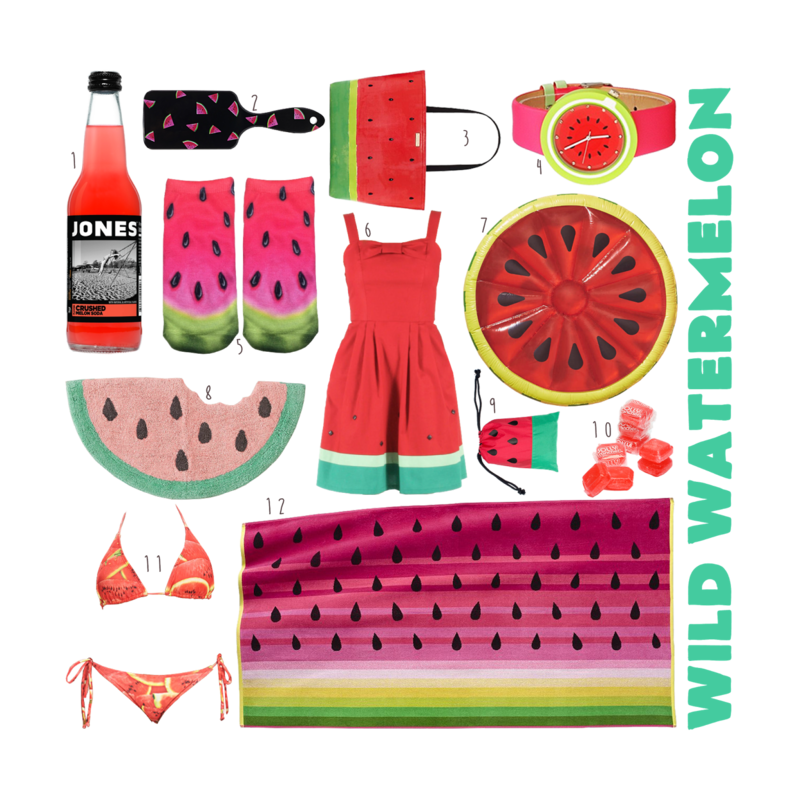 I ruined my mom's most recent watermelon beach towel, so I may need to purchase this one. This is probably one of the places where a watermelon motif is absolutely appropriate and not at all out of place. I hope you've enjoyed this little roundup! Perhaps you should eat some actual watermelon now?